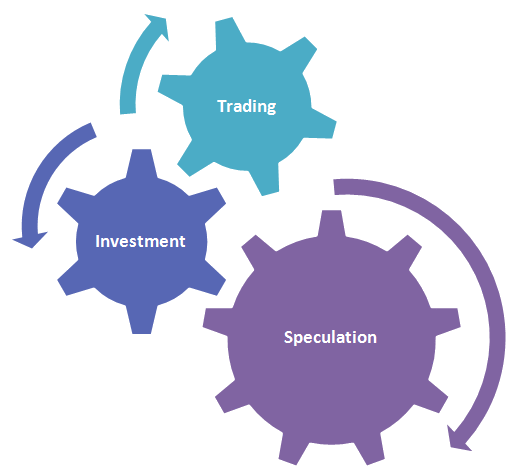 Home » Investing » Trading » Automated Trading » What is the Difference between Trading, Investment and Speculation? What is the Difference between Trading, Investment and Speculation? We have spoken to numerous people who are involved in investment activities from some time but then we realised that people didn’t know the “difference between Trading, Investment and Speculation” after that we have thought to add this article in our learnings for our reads to clarify and improve their knowledge when they are reading tutorial on basic concepts of investment. There are few terms which possess almost same meaning but in real terms there is a vast differences. Let us understand about difference between Trading, Investment and Speculation. Mostly traders adopt ‘Buy and Sell’ strategy to make profit from short term investment. Activities performed while investing is termed as trading or trading activities. For example: Buying stocks, selling properties from that money again purchasing gold and selling stocks such kind of activities are called as trading activities. Traders are concern about short term price fluctuation to make decision on what price they wish to buy or sell particular assets. Traders normally follow graphs, charts, patterns of the stock or any other assets to predict the short term price fluctuation for decision making. Mostly Investors adopt ‘Buy and Hold’ strategically to make handsome profit from long term investment. Investing means proactive use of cash to generate wealth. In other words rather you work for money let money works for you thru the means of investing. For example: buying assets like stocks, precious metals, properties, bonds, etc with the intension to sell on the future date with capital appreciation returns. Assets includes anything from fine arts, rare coins, mutual funds, bonds, properties, stocks, antiques, copyright materials, trademarks, patents or any other intellectual properties. Capital appreciation or expected returns or potential profit or potential risk attached to the assets class varies from assets to assets. Mostly speculators are those who make their living out of hope. A God Father of Investor ‘Benjamin Graham’ has explained classy in his book ‘The Intelligent Investor’ and in one of his 1951 book ‘Security Analysis’. He suggested that key principle of successful investment is when stock or assets are functioning like a good business or good company. A good business operation should guarantee investors on promises, facts, safety, security with satisfactory returns any this apart from these operations which doesn’t meet business goals are term as speculative. Let us summarize that any buying or selling activities performed with long term goal is known as investing whereas with short term goal is known as trading and speculations are basically rumours or gossips spread about the stock or assets without base of facts. » Currently Reading: What is the Difference between Trading, Investment and Speculation? ← What is Rule of 72, 114 and 144 of Compounding Interest, Formula and Examples?